Perfect for eating honey on toast under a tree on chilly mornings. Knit flat sideways and seamed to form the thumb opening, these are simple and speedy to make but full of style. I love the way these hug each part of my hand. 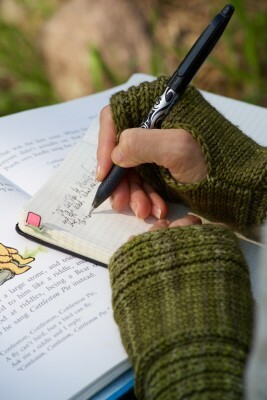 They are super simple to knit and use either sport or DK yarn. The hand warmers also have a matching free Thotful Spot Hat. 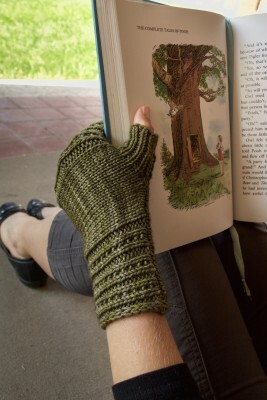 The optional thumb is picked up from the edges of the thumb hole once it’s seamed, and knit in the round. The thumb looks admittedly silly when unworn, but is very comfortable. Life is awesome. Get out there and enjoy all of its moments, even if you’re just eating breakfast on the front steps or sipping tea out of a travel mug while walking to work.